Yesterday we assessed the impact a second Obama term would have on the US economy and markets. Now let’s assess what impact a Romney Presidency would have on the US economy and financial markets. For starters, Romney has already stated that he would fire Fed Chairman Ben Bernanke if he wins office. While this doesn’t represent the real shakeup that the Fed needs, it’s definitely a step in the right direction. With that in mind, if Romney wins and makes good on this promise to fire Bernanke, then we need to consider that any market rally that occurs based on the perception that the US economy would strengthen would be short-lived. The reason for this is that the primary driver of stock prices over the last four years has been the hope and promise of Fed intervention. So if Bernanke were to be fired (or more likely step down as Fed Chairman) the market would lose one of its biggest props. What would follow would be a potentially hellacious correction as the markets adjusted to the underlying realities of the US economy. Based on the business cycle, this would put the S&P 500 down near 1,000 or so (and that’s ignoring any other negative items developing). This was the very problem with the Fed intervening so heavily to begin with: by attempting to prop the markets up, the Fed didn’t let the bad debts clear out of the system. As a result, the big reset has been pushed down the road. 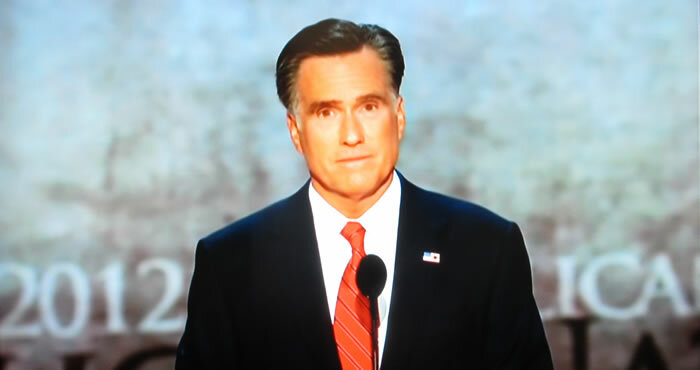 If Romney wins the Presidency, it’s quite possible he would let that reset finally hit. After all, he could easily fire the economists at the BLS who have massaged the data, fire Ben Bernanke, and then blame the subsequent market correction and bad, but realistic economic data on Obama (much as Obama has blamed the bad economy he inherited on Bush). Another issue to consider is that if Romney wins and does fire Bernanke and cuts back on spending, then the “inflation trade” could take a hit. Bear in mind, Gold and Silver would continue to see increased demand based on investors fleeing the Euro and from Central Banks buying. However, a Romney win, accompanied by cuts in Government spending, would result in a powerful US Dollar rally, especially when you consider the state of affairs in other major world currencies (the Euro, Yen, and Yuan will all likely collapse before the US Dollar). I have noted, as I am sure you have, that both Mitt Romney and Paul Ryan have mentioned that if the US does not get its deficit and debt in check, it will end up like “Greece.” The Obama camp has made no such statements and in fact never refers to the European disaster. I also want to draw your attention to the fact that several EU leaders have stated that the Obama administration has asked for them to keep things calm until after the election. “The Obama administration doesn’t want anything on a macroeconomic scale that is going to rock the global economy before November 6,” a senior EU official told Reuters, adding that previous troika reports had also slipped. The European Commission’s representative on the troika, Matthias Mors, denied that the report could be delayed, and an official at Greece’s finance ministry said he had been assured that there would be no slippage. A U.S. official said the United States had made clear to European officials that it wanted to avoid any “downside” economic surprises because of the fragile U.S. recovery, but denied that it had anything to do with the U.S. election. Several sources in Germany described those conversations with their U.S. counterparts and said the message had been that the Americans didn’t want surprises before the election. This, combined with reports that EU leaders do not like Romney indicates that they perceive Romney as a threat. Given that the EU is only being held together by Central Bank intervention, this threat can only be based on the idea that Romney will not move to help Europe with its financial difficulties (and will be anti-Fed intervention). So, if Romney wins the election and pulls back from aiding Europe (Europe will collapse at some point no matter who wins, but it’s clear that Obama would be more lenient in terms of providing help) then a Euro collapse would certainly have a negative impact on precious metals. However, this move would be short-lived as investors would increasingly turn to Gold and Silver once major paper currencies began to fail. So if Romney wins the election and makes good on his promises to cut spending, rein in the debt, and fire Bernanke we would very likely see another round of deflation. However, after this period ends, the US stock market and economy would begin to actually put in a sound base from which to grow. At that point we would have a truly extraordinary opportunity to buy many high quality companies at truly insane prices. So… make a wishlist of companies you’d like to own in case of a Romney victory. Watch and wait for Romney to actually fulfill his promises (if he doesn’t the outcome will be very similar to if Obama wins: more debt, more spending, and more inflation). If he does, the markets will correct sharply. But after the smoke clears, it will be time to buy in a big way. Now more than ever, investors need to get access to high quality guidance and insights. There sheer magnitude of the issues the global financial system is facing is enormous!